I’ve been asked on several occasions to help wrap lumpia for various clubs, organizations, and parties. I decided to try to make these “lumpia wrapping parties” a little more effective. The main problem when wrapping lumpia is the time spent gossiping and less time wrapping. So even after 3 hours and 10 people the total number of wrapped lumpia is under 100. The other problem is food contamination with the number of hands. Germs scare me and if you ever see me in the kitchen I’m washing my hands after I touch anything. In order to increase wrapping speed and decrease contamination came up with the idea to use an pastry bag to squeeze the meat onto the lumpia wrapper. (I feel like this is the same way mass production companies do it for their lumpia, if not, maybe I’ll sell my idea). Using an pastry bag also squeezes the correct amount of filling at the right size and shape to create more uniformed looking lumpia. Please note that this only works with the “shanghai” style of lumpia. thanks edel. this is great! u dont know how much i will be using this in the future… in fact im going to print this out and put it in a safe deposit box so one day my kids will never have to go through the same lumpia wrapping frustrations i have suffered when they have “lumpia wrapping parties!” take care! yay food processor!!!!!!! saves lives (or at least fingers). 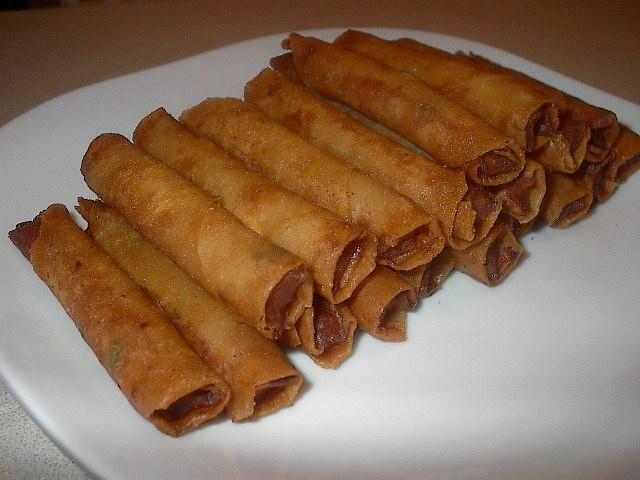 you should clarify that this the “lumpia shanghai” recipe though. i miss lumpia making time…NOT. seriously though, do miss it. thanks for your 3 years of PALS dedication. cheers! I forgot something. Add chives or green onions for color and taste. If you add chives or green onion, you can reduce the amount of onions.